We are Zak & Sarah. We met at university in 2012, we’re a cameraman and photographer. Zak is from Bristol and Sarah is from Staffordshire. We have an orange 1994 VW T4 Short wheel base. We took the plunge and bought our van in December 2015. Zak grew up around people traveling/living in vans and would go on camping holidays every year with his family down to Cornwall and see surfers etc also living in vans. He has said ever since then that was the dream and he wanted to do it at some point in his life. Sarah had a different up-bringing and wasn’t aware of this lifestyle until meeting Zak at university, so the idea was a little more daunting for her. But after a few years joining Zak’s family on camping holidays, she was converted! 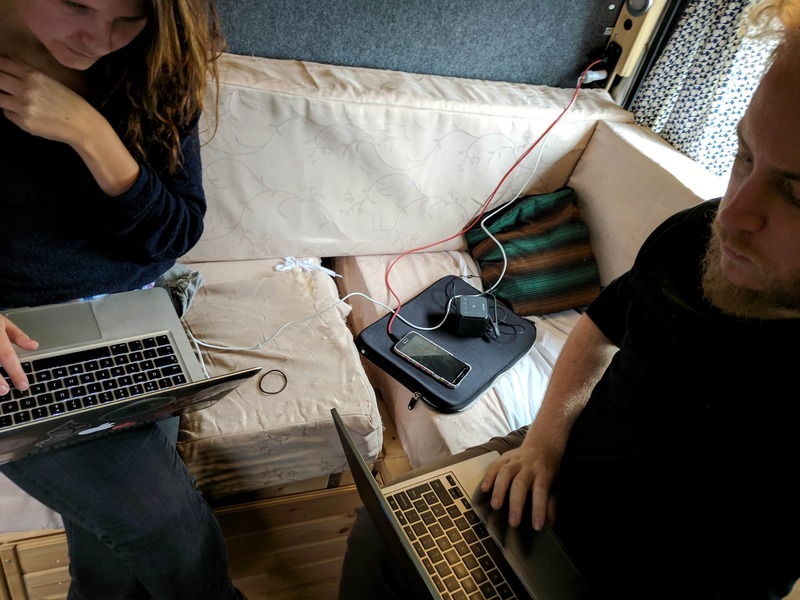 After graduating university we were both on the job hunt and getting nowhere, the idea of living/travelling in a van became a real possibility instead of wasting our lives away searching for jobs. Zak’s dream then started to become a reality and became our joint adventure. We started looking at vans seriously and within a few months we welcomed Max into the family. There’s too many good things! Firstly, freedom. We have the ability to go anywhere! We don’t need to worry about taking time off work for a holiday and booking a place to go, we can just turn up and stay for as long as we like. We also have everything we need already with us, and it makes us realise how much stuff we have at home that we don’t need. Another of our favourite things is that we get to experience and see things that we wouldn’t normally if we were on holiday. With the van you can experience the way of the locals, and if you like a place you can stay for as long as you like. (If you find a good place to camp!) If you don’t like a place, just move on. We get to wake up to the most amazing views and call some incredible places our garden. Obviously it’s not all amazing locations and we’ve had our fair share of dirty carparks and truck stops, but the positives outweigh the negatives massively. For us, we think the hardest part might be fully adapting to living in a van, and letting go of some luxuries of home life. 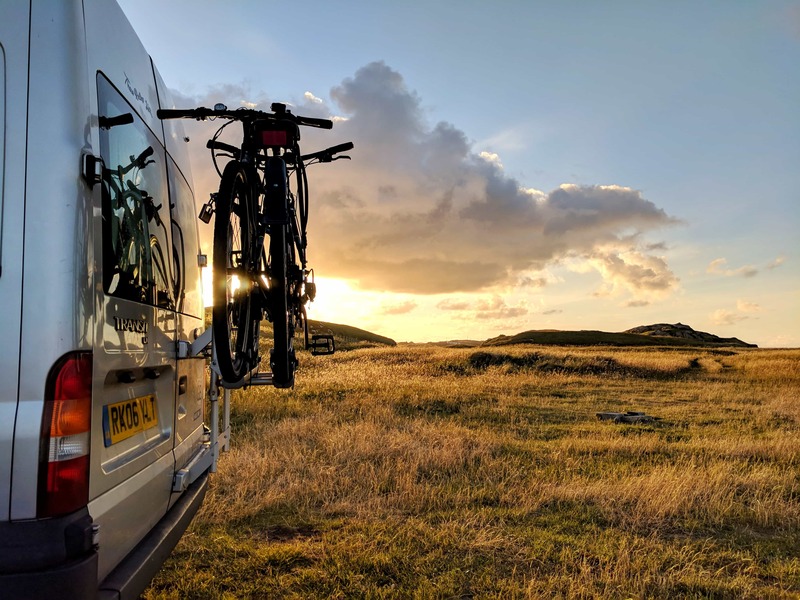 This is very particular to us and some van lifers might not agree, but we’ve been living full time in our van for 9 months now (without a toilet or shower) and our van is pretty small. So maybe this answer would be different if we had a bigger van with some more luxuries like being able to stand up straight! But it’s all a learning curve and things to improve in the next van. But we do love our little van! These luxuries are just something to think about if we decided to live full time and forever in our van. Also finding a balance between ‘living’ and ‘travelling’. We really scrutinise everything we spend, deciding whether it’s a necessary purchase or a waste of money. Sometimes we struggle with this, finding a balance between being cautious with our money so we can travel for longer and using some money to experience things we might not get the chance to again. We have to remember that we’re here to travel but we also want to have fun! Sometimes we forget that. Sarah would probably be working as a freelance photographer. And together we’d probably be looking for some sort of adventure! 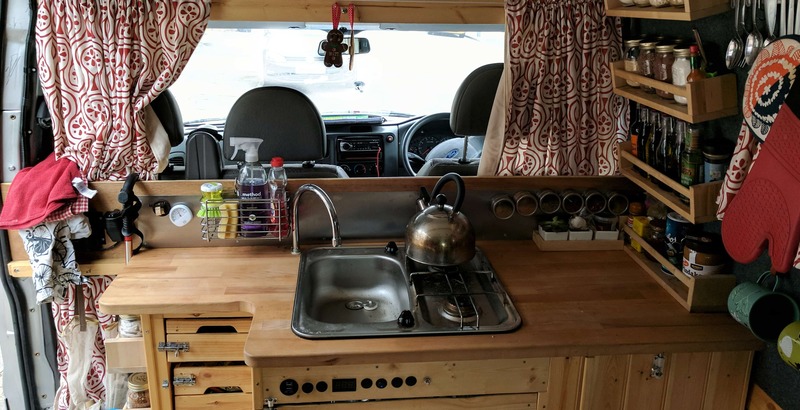 As we said before our style of bed really works for our van but if we were to get a bigger van we’d think about a static bed for full time living, as the morning routine of changing our living space from bedroom to living/kitchen can get a little tiresome. Also, Sarah’s favourite place in our van is the glovebox. If you’re ever looking for something and can’t find it, it’s in the glovebox! What surprised us most isn’t actually anything about our lives in our van, it’s the lack of people that we meet on the road. When you look on social media it seems that everyone is out in their vans travelling! But in reality there isn’t actually a lot of people around and we’ve barely met anyone living in a van. We’ve met loads of older people living in motorhomes, mostly for a few weeks but occasionally we meet a retired couple who live in their motorhome full time and it’s awesome. But before we set out on the road we were almost expecting to meet loads of people in vans like us, but in reality Europe is so big that we never really stood a chance at being in the same place at the same time as some other van lifers! Although we have met plenty of people along our travels and love meeting people, we think social media makes it seem like there’s a lot more people around (in vans) than there actually is. 100% just go for it. Cut your ties, quit your job and live your dreams! If it’s something you seriously want to do then nothing should stop you, there’s plenty of jobs out there. But also we’d say to be prepared that you can never fully be prepared for whatever you will experience while living/travelling in a van. You can research and download all the apps to help find places to stay etc, but you’ll never be able to prepare for life on the road because it’s so unpredictable. And that’s the beauty of it! You’re constantly learning and evolving as a person/couple and creating memories you’ll never forget, so just go with it. Take the plunge, you’ll be thankful later in life! 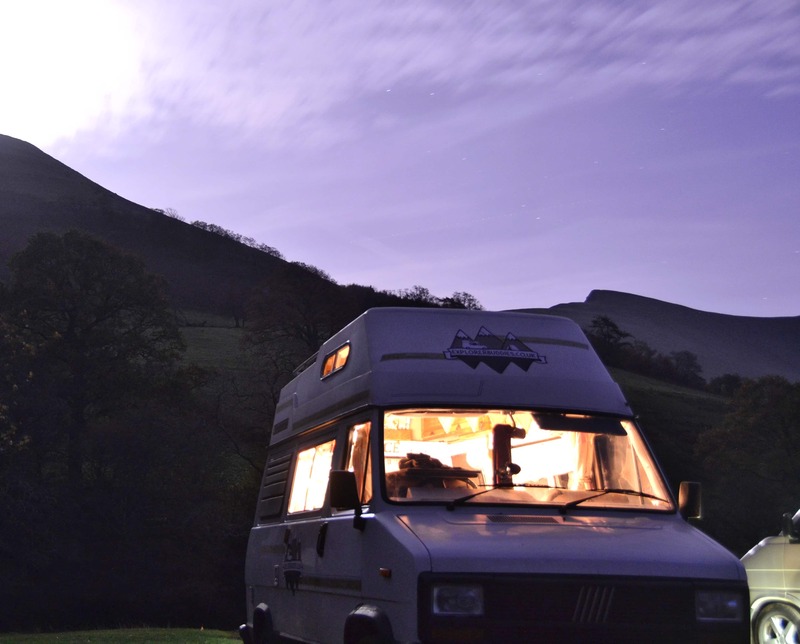 Oh and we’d also say to not believe everything you see on Instagram about living in a van. There’s a lot of stuff behind the scenes that you only ever find out when you do it yourself, it’s not all amazing scenery and experiences! But as we said before, the positives outweigh the negatives, but you have to be aware of them as van life might not be for everybody.